Botswana's Okavango delta, with its abundant wildlife, is one of the most beautiful places on Earth. Over 400 types of birds can be spotted in the Delta, along with many of Africa's larger animal species. One morning, we came across a female leopard in a thicket, not far from our camp. At first she was hidden in the dense bush but she soon emerged and jumped onto a fallen tree. We were delighted to see two adorable little cubs follow closely behind! We spent a wonderful morning watching the cubs frolic on the tree while their mother rested in the shade. 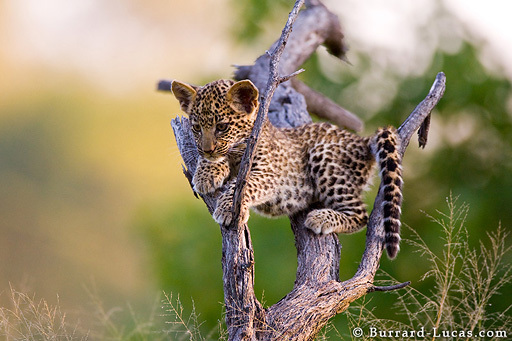 At one point, this cub clambered into the upturned branches and posed for a split-second before pouncing on its sibling!